I almost wasn't in this band. Originally, Rob Pettersen (of Portraits Of Past fame) was asked to front The Angel Assassins but he declined as he also wanted to play guitar. He suggested that they ask me instead and the rest is history. Our first show was a disaster. I was nervous because I was 18 years old and had never performed music in front of people before and just about every single person I knew was there. Steve played double-time for some reason (which caused him to smell of old men the next day as he applied Ben-Gay to his sore arms in the van on the way down to our show in Santa Cruz). The gig was at an enormous theater at the University San Francisco and most of our sound got lost up in the rafters, causing much confusion. The show in Santa Cruz also went poorly (which wasn't helped by the fact that we showed up almost two hours late), and if our third show hadn't gone much, much better we probably would have called it quits. But it did, so we didn't. Another show that started terribly (but ended well) was the one we played in Santa Barbara. We had a long drive down from San Francisco (in Michael's parent's baby blue 70s VW Vanagon that only he and I could drive because it had a manual transmission) and showed up pretty much in time to grab a root beer from the keg and play. 3 minutes in Kent McClard announced "set your phasers to stun!" and left the room. Then Julian broke the headstock of his bass clean off -- over someone's head. The night was salvaged (ironically) when the cops showed up to shut the show down (the second show we played with Nuzzle that got shutdown by the cops), and some kid with a mohawk jumped in the police cruiser and drove off with it. Legendary. We went on one tour -- 5 shows up the west coast and back. We went with our friend Fire Engine Grey and traveled in their van (which went by the name of Otto), and my car (which was a 1991 Hyundai Excel whose clutch went out in Vancouver, leaving the most horrible aroma). Since neither band had a record out (nor did either of us have so much as a demo tape to sell) we played 4 shows to virtually nobody and one show at an internet cafe (a relatively new phenomenon in 1997) to well over 100 people. Between the ten of us on the road there was plenty of bickering and infighting to go around, but somehow we managed not to all kill each other. 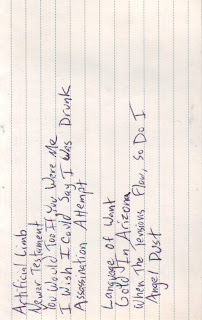 Which was essentially the story of the band. The four of us really did not get along very well. I was forcibly ejected a few weeks after the tour ended, and a few months after that the band was done. It was right about then that the single came out, of course. 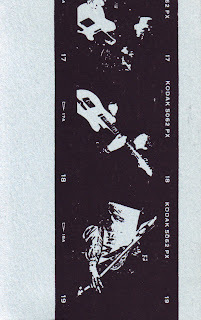 In addition to the single, the cassette (of which there are reputedly 100), and some related ephemera (flyers, stickers, etc), I am including two mixes of our complete sessions, which were originally intended to be an LP (albeit one that is 15 minutes long). 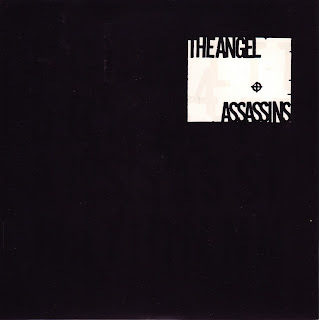 Ladies and gentlemen, for your listening pleasure, The Angel Assassins. congratulations on your first year! amazed at all that you've posted so far. i lived in san diego from 1991 to late 2002, and cant believe some of the stuff you've posted! keep it up, and here's to many more years of pukekos! a quick note though, for the new year coming (and the numerous to follow)what about including the recordings' year of release? anyway,thanks for the great work. anyway, you said "and I dare you to try to guess which one we made and which one the promoter did"
Happy belated launch day! Love your blog, which is named Pukekos (not PukeOS). Congrats on the anniversary! Only recently discovered your blog but am loving what you're posting. I second the request for the year of release, if it's known!